Welcome to our Standard Business Card template form. This is a FREE service exclusively from Momentoprint available to customers who have placed a Business Card order but who do not have artwork to supply. 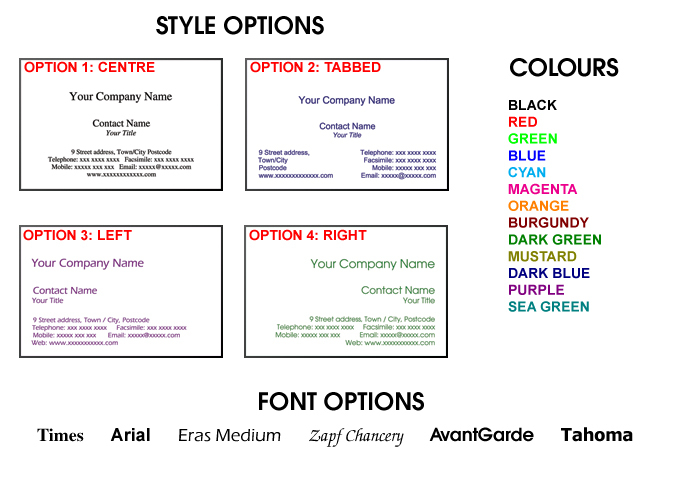 This simple form will allow us to create a fully personalized Business Card for you. (Please note this is the Standard Business Card form which is suitable for our Urgent Business Cards range and Non-Laminated Business Card range. If you have placed an order for our Luxury Matt Laminated Business Cards please access our ‘Business Card Template 2: Deluxe’ page). Simply enter your Invoice number (from the conformation email you will have received when placing your order) into the field below along with your card format options (Fonts, Colours etc. See diagram below) and the details you wish to include on the card. If any of the fields are not applicable to you simply leave them blank. Once submitted we will aim to have a proofing link available for you within one working day. After Submission return to Your Confirmation Page.